Casa de los Suenos 'The house of dreams,' is a private villa, within walking distance to town, and around the corner from the beach. We operate the villa as an owner in residence bed and breakfast and the rooms are rented out separately. You will automatically be given the rate for our Queen room by the system and details on the rates for our other two rooms are on our rate page. Our home is perfect for anyone who desires luxury at a reasonable price. This slice of paradise is set back from the road, nestled among beautiful palm trees and a private garden - a cool sanctuary from the heat. The large, high-ceilings, plant filled rooms,and original artwork lend to the feeling of a welcoming Mexican villa. We offer air conditioning, ceiling fans, Cable TV, Wi-Fi access in the entire house, large living room, dining room, fully equipped kitchen with a separate refrigerator for the guests use. and the pool and patio area. A slice of Heaven! Each room was created to compliment & flow into the next. We have three individual rooms available for rent and they include a wonderful continental breakfast made from all local fresh ingredients. The King Suite measures approximately 750 square feet, has a California King bed, two couches, cable TV, air conditioning, wi-fi access. private balcony with a view of the ocean, and in-suite bathroom with dual shower heads, dual sinks and a jacuzzi tub. The Queen bedroom, which measures approximately 350 square feet, has two Queen beds, cable TV, wi-fi access, air conditioning, a small couch, a sliding glass door for ventilation, and its own in-suite bathroom. The Palapa room measures 200 square feet and has a Queen bed. While this is the smallest room in the house it is also the most special. It is by itself on the third floor, roof area of the house, and has windows on three sides of the room for beautiful views of the jungle and ocean. This rooms comes with a small refrigerator, coffee pot, private in-suite bathroom, Wi-Fi access and a large private balcony which measures 11 x 15 feet. Please make an inquiry even if our calendar shows us as booked. Since we rent the rooms out individually we might still have another available! Puerto Morelos is a quaint village that is nestled between the two major resorts on the Mayan Riviera-Cancun & Playa del Carmen, providing you with a unique Mexican vacation. There are so many activities you will wish you had a longer time to stay! Your hosts are Kim and Jim, originally from the United States, and their well behaved adopted Mexican puppy, Guapo. 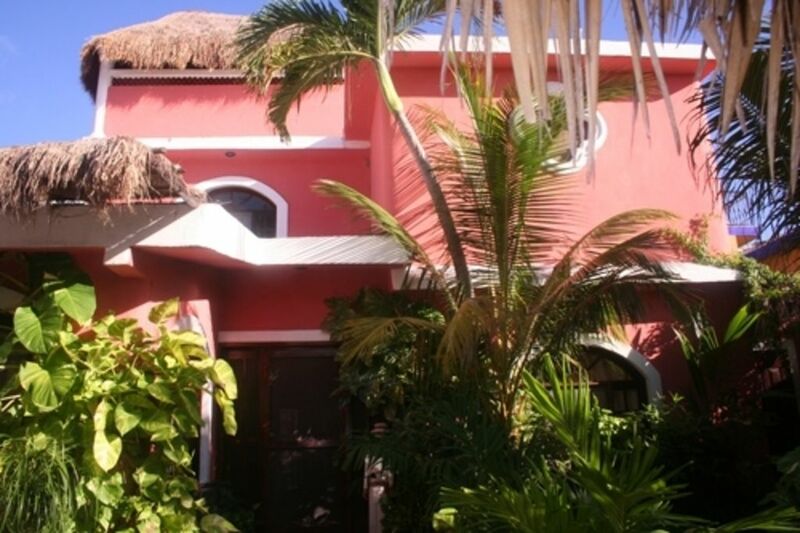 Mi Casa Es Su Casa... so come on down & enjoy your own little piece of paradise in Puerto Morelos Mexico. This house was built by my father in 1992 and when our family was not enjoying it ourselves we rented the entire house out as a vacation home. I recently moved to Puerto Morelos and am now running the house as a bed and breakfast. You can now enjoy the benefits of staying in a large 3,000 square foot Mexican Villa without the cost of renting the entire house. Because we live on site you always have someone available to answer any questions - where are the good restaurants, which ruins or cenotes should you go to and how do you get there, how and where do you exchange money, how do you make a phone call to the states, etc. Any question or concern you may have we can help you with. Each room has it's own in-suite bathroom. Towels, bath and hand soap and hair dryers are provided. Our house man will do a load of laundry for 150 peso's. Includes washing, drying and folding. Smoking allowed outside on the property. their dream house. for us, an affordable chance to experience the cancun area outside of the resort circuit and away from the tour buses, on our own from a base in their villa in peaceful, magical puerto morelos. my wife and teenage son and i had a wonderful time and the wisdom of jim and kim is indispensable. thanks so much kim and jim for the safe water and the wonderful mexican coffee and for breakfast for the fam and for the privacy and comforts of home, etc., etc. and especially for all of your priceless guidance. muchas gracias. here's to you. Kim and Jim gave us a PERFECT week in Mexico! We were a family of 6: 2 kids, 2 parents, 2 grandparents that filled up this home. At first we were a bit uncertain about sharing the space with our hosts, Kim and Jim (and their two dogs), but we quickly learned that they were the best part of the experience. We'd hang out with them at various times during the day, chatting about local history, sharing stories, and getting advice on what to do. They were constantly interested and interesting, and served us an incredible breakfast each day. Their help in making arrangements for different activities was invaluable, and every one of the rooms in their beautiful house was wonderful. We will certainly be visiting them again! Thank you for the lovely review. It was our pleasure to meet you and your lovely family and we are so glad you enjoyed your stay with us. We look forward to being able to host you again!! We made the right choice! Great hosts, great location, great place to settle and savor. Kim and Jim are the best hosts! Accommodations were comfortable, cozy, and serene. We had the pleasure of staying in two of their three rooms and highly recommend a stay in the palapa room for the experience! Fantastic breezes and view. For a longer stay the king is like having an apartment! We enjoyed breakfasts and visiting with other guests. Bikes provided allowed us a quick ride into town. And Yoga on the deck overlooking the beach was just around the corner. When we did venture further out from the slow pace of this adorable town, Kim’s help in making plans was indispensable. There was so much we loved, and as I said in my summary, we made the right choice in accommodations for our three weeks in paradise. Thanks to Kim and Jim! Thank you for the lovey review. It was our pleasure hosting both of you in our home for your introduction to our beautiful little town. We hope to be able to enjoy your company again in the future. Our stay with Kim & Jim was everything we expected and more. We wanted for nothing. The most comfortable bed, quiet nights, delicious breakfast, luxurious bathroom. We thoroughly enjoyed Puerto Morelos and our hosts made the trip wonderful. Thanks so much. Thank you for the review. It was lovely meeting both of you and we are glad you enjoyed your stay in our home. Puerto Morelos is living at it's best! Puerto Morelos has been joyfully missed by the big developers, so our town has stayed a delightful mix of Mexican and Mayan families, Americans and Canadians plus other nationalities that all want to experience the special life and energy that this noted spiritual vortex of the world offers. We have a great assortment of restaurants, gift shops, money exchanges, travel agents, liquor store, car rentals, water sport equipment rentals and boats for snorkeling or diving all here in town. If you want to go to Cancun or Playa del Carmen there are even more great restaurants and shopping to be had in both places. Playa del Carmen's pedestrian walk, Islands of Cozumel and Isle Mujeres, Xcaret, Xel-Ha, Tres Rios, Mayan ruins, Cenotes, are all within an easy drive of Puerto Morelos. The options are endless for a fabulous holiday!